To be successful in any endeavor, confidence is key. Simply put if you don’t believe in yourself, who will? Though these statements are simple and true, I have difficulty applying them to my life because I have two sides when it comes to confidence. 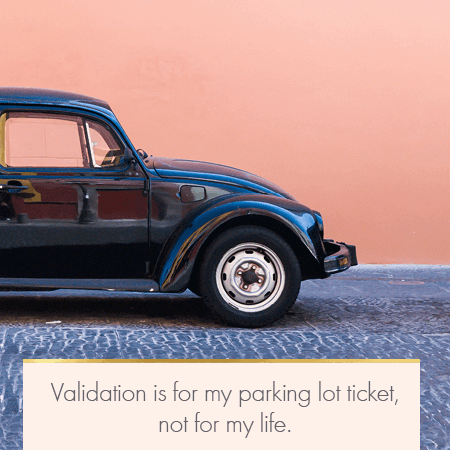 On a good day, I know my worth and I am ready to tout it with a social media post that says, “Validation is for my parking lot ticket not for my life!” On a bad day, however, my social media post could say instead, “Tell the negative committee that meets inside your head to sit down and be quiet!” I think that having these disparate attitudes is common, but just imagine what a lucrative career I would have if I could negotiate all business deals with the first mindset instead of the second. For those who identify with this duality, I would like to propose a two-part game plan to bolster confidence. The first part will help you get rid of the naysayer in your head and the second will further empower you. This plan is taught in the first Chicken Soup for the Soul book which was compiled by Jack Canfield and Mark Victor Hansen. The book contains over one hundred stories and the one to which I refer is attributed to Chick Moorman. It is the story of a fourth-grade teacher who is leading her class in a timed writing exercise where they are creating long lists of all the things they cannot do. A supervisor is in the room observing the lesson, and he can’t quite figure out why the teacher is having the kids write the things they cannot do as opposed to writing the things that they can, but he does not interfere. When the time is up, all the kids come to the front of the room and put their lists of “I Can’ts” into a shoe box. The teacher takes the box, the students, and a shovel outside where she proceeds to hold a funeral for “I Can’t,” complete with burial of the box. In her eulogy she mentions that “I Can’t” is survived by three siblings who are named, “I Can,” “I Will,” and “I’m Going to Right Away.” Closing her remarks, she says, “May ‘I Can’t’ rest in peace and may everyone present pick up their lives and move forward in his absence. Amen.” As you can imagine, from that day forward, no child ever claimed that he/she was unable to do things because “I Can’t” was dead and buried in the schoolyard. Now that your can’ts are six feet under, here’s a way to shout your cans from the mountaintops. This plan is taught in a book called The War of Art by Steven Pressfield. In it, he addresses people who are trying to reach their greatest potential. This can be in the pursuit of the creative arts, or it can be in the launching of an entrepreneurial venture, or it can be in attaining spiritual advancement or education, etc. Whatever the calling, it is something that requires long-term growth as opposed to instant gratification. Pressfield goes on to list a multitude of things that get in the way of reaching these long-term goals and he labels them all “resistance.” One type of resistance is self-doubt. Along these same lines, I saw a funny social media post that said, “I have a problem with low self-confidence which is really ridiculous when you consider how amazing I am.” Thanks to the game plan advanced in this article, your low self-confidence is now gone and all that remains is your amazing-ness! And guess what? When it comes time to speak up for yourself in a business setting, you’ve gone from being your worst enemy to being your best advocate, and that’s no laughing matter!